Robert Plant’s new band Saving Grace played a surprise show at the end of January at the Sparc Theatre in Bishop’s Castle. Plant is joined in the lineup by Suzy Dian on vocals, Tony Kelsey on guitar and mandolin, Matt Worley on banjo and guitar and percussionist Oli Jefferson. Saving Grace also played with Kiki Dee and Carmelo Luggeri at St George's Hall, Bewdley, on Monday evening. And while there’s been no official word from Plant about the band, it’s been revealed that they'll support Fairport Convention for three shows over the coming days. Fairport Convention say on their website: "Our dear friend Robert Plant has a lovely new band called Saving Grace. He asked us if we could help by having them play some gigs on our current tour. "We have tried to keep the three dates they are doing with us 'hushed up' but the worst kept secret of 2019 is out now." They add: "It’s the 40th anniversary of Cropredy and Led Zeppelin's Knebworth gigs this year and it’s nice of Robert and the band to join us for these three dates. We know you are in for a real treat." Those shows will take place at The Anvil in Basingstoke tomorrow (February 14), The Forum in Bath on February 16 and The Alban Arena in St Albans on February 22. 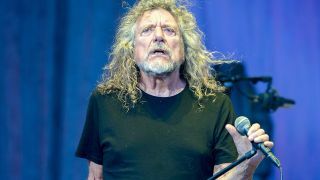 Plant’s last studio album was 2017’s Carry Fire and he’ll also play at the Love Rocks NYC benefit concert at New York’s Beacon Theatre on March 7.